Bye-bye Paper Work! 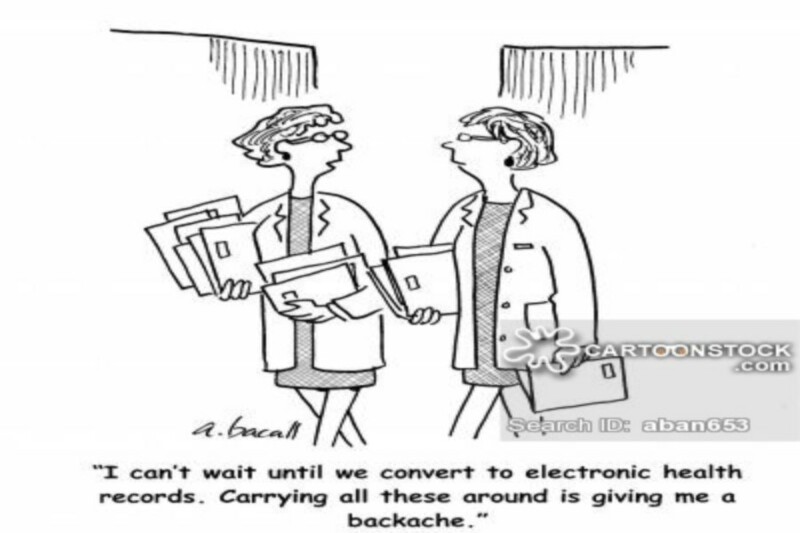 Welcome Electronic Health Records! Digitalization of information related to patients including their medical history, diagnoses, medications, treatment plans, immunization dates, allergies, radiology images, and laboratory and test results is being made possible with Electronic Health Records (EHRs). EHRs increase patient participation, and improve diagnostic and treatment outcomes. 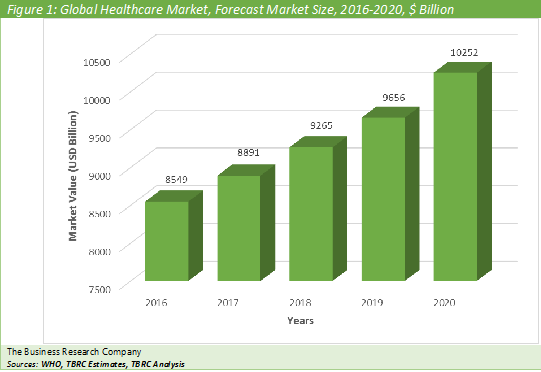 HEALTHCARE MARKET TO GROW TO $10.2 TRILLION BY 2020 ACCORDING TO THE BUSINESS RESEARCH COMPANY. The Business Research Company expects the healthcare market to grow to $10.2 trillion in 2020. The Americas was the largest region in the healthcare market in 2016, accounting for almost half of the market. According to The Business Research Company’s Healthcare Consultant, Sravanthi Addapally, the aging population profile of most countries contributed to the growth of the healthcare market. During the forecast period, the number of people globally over the age of 65 grew from below 450 million to 601 million, an increase of 33%, according to estimates based on Population Reference Bureau data. As healthcare services are more popular and important for older people this drove the market during this period. This trend is expected to continue throughout the forecast period. The percentage of seniors is expected to grow from 24% in 2012 to 40% in 2050 in Japan. The increase in the aging population has increased the patient pool of many chronic diseases such as rheumatoid arthritis, diabetes and cancer. For example, in the US, there were about 11.2 million diabetic patients in the 65+ age group. This has led to increased demand for healthcare services and facilities, significantly impacting market growth during this period. The UK’s National Health Service the largest company in the healthcare market in 2016 with a 2.08 % share. Funding for the NHS comes directly from taxation. For 2015-16, the overall NHS budget was around $178.1 billion. The healthcare industry is one of the largest and fast growing industries in the world, and it has a direct effect on the quality of life of patients. The term healthcare refers to diagnosis, treatment, and prevention of disease or illness, and other physical and mental impairments in humans and animals. The healthcare industry provides products and services to treat patients with curative, preventive, rehabilitative or palliative care. Healthcare products which mainly include drugs and medical equipment are manufactured by several companies and are approved by regulatory authorities. Healthcare services are delivered by practitioners in medicine, chiropractic, dentistry, nursing, pharmacy, allied health, and other care providers. The provision of healthcare services can be either from private profit-making providers, or managed and funded by government agencies. The chart below shows the year-on-year growth of the global hospitality market during 2016 - 2020. Access to healthcare varies across countries. It is largely influenced by social and economic conditions as well as the health policies. Each country has specific policies and plans in relation to the personal and population-based health care goals. According to World Health Organization (WHO), a well-functioning health care system requires a robust financing mechanism, a well-trained and adequately-paid workforce, reliable information on which to base decisions and policies, and well maintained health facilities and logistics to deliver quality medicines and technologies. The healthcare industry can broadly be segmented into three categories– pharmaceuticals, medical equipment/devices and health care services and facilities. Healthcare Services The healthcare services sector is the largest sector in the overall healthcare industry. It is comprised of comprised of many subsectors. It includes hospitals, outpatient care centers, medical and diagnostic laboratories, dental clinics, nursing and residential care facilities, ambulatory healthcare services, veterinary services and many more. Pharmaceuticals The Pharmaceutical industry is an important component of healthcare industry. It is comprised of many public and private organizations that discover, develop, manufacture and market medicines for human and animal health. Medicines minimize the need for inpatient and invasive care services such as surgeries. Drugs are subjected to a many laws and regulations regarding the patenting, testing and ensuring safety and efficacy and marketing of drugs. Pharmaceutical industry is largely driven by discovery and development of novel drugs. Drug manufactures rely on chemical manufacturers, bulk drug manufactures and drug manufacturing equipment companies for the production of the drugs. Academic, government and industry scientists, practicing physicians and pharmacists, as well as the public, influence the pharmaceutical industry. Medical Devices The medical devices industry offers wide range of medical equipment, hospital supplies, and invitro diagnostic devices and substances. This industry mainly aims for developing novel technologies which helps in early diagnosis and treatment of diseases. The major sub-segments of this industry include electro-medical equipment, irradiation apparatuses, surgical instruments and supplies, dental equipment and supplies. Healthcare Global Market Briefing is a detailed report giving a unique insight into this market. The report is priced at $750 for an individual user. To use across your office the price is $1000 and $1300 if you wish to use across a multinational company. About The Business Research Company Visit TheBusinessResearchCompany.com, mail info@tbrc.info or call +447443439350 or +918897263534 or +919160996838 for more information on this and many other titles. The Business Research Company is a market research and intelligence company, which excels in company, market and consumer research. It has research professionals at its offices in the UK, India and the US as well a network of trained researchers globally. It has specialist consultants in a wide range of industries including manufacturing, healthcare, chemicals and technology. The Business Research Company's management has more than 20 years of varied business research experience. They have delivered hundreds of research projects to the senior management of some of the world's largest organizations.